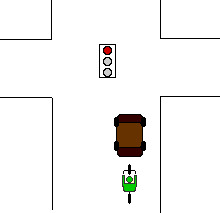 You come to a stop to the right of a car already waiting at a red light or stop sign. They don't see you. When the light turns green, you go forward, and they turn right, right into you. Even small cars can miss seeing you in their blindspot, but this scenario is especially dangerous when it is a bus or truck that you're stopping next to. An Austin cyclist was killed in 1994 when he stopped to the right of a semi, and then it turned right. He was crushed under its wheels. Never stop in a car's blind spot. 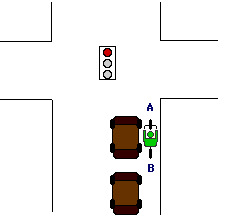 Simply stop behind a car, rather than to the right of it, as in the below diagram. This makes you easily visible to traffic on all sides. It is impossible for the car behind you to miss you when you are directly in front of it.